The name may sound impressive and they may look a bit fancy – like you went to extra effort – but hasselback roast potatoes are in fact super easy to make. Swedish in origin, what sets the hasselback apart from any other roast potato, is the way it is cut. Dozens of narrow cuts across the width of the potato fan open as they roast, leaving you with plenty of crunchy edges and lovely soft creamy flesh inside. 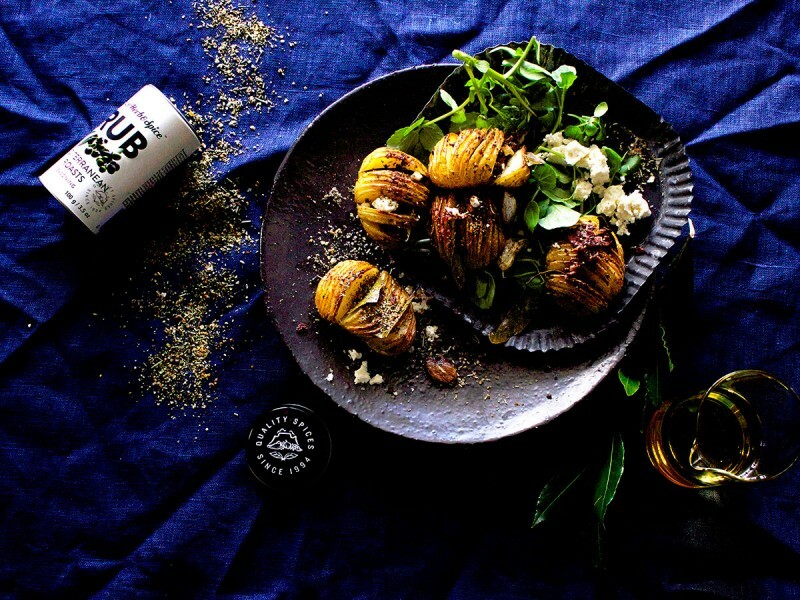 You could just toss them in a bit of melted butter, olive oil and salt and in the oven they go, but the addition of Cape Herb & Spice’s Mediterranean Roast Rub Seasoning elevates them to a dinner party delight. These Swedish beauties are the perfect accompaniment to any roast, but go particularly well with roast leg of lamb or chicken. When topped with bacon crumbs and a sprinkling of feta, they make the ideal light lunch with a green salad. If you are using them, cut each bay leaf in half and wedge half a leaf in each of the potatoes. Heat a roasting dish or saucepan that can go both on your stovetop and in the oven, and add the olive oil, butter and crushed garlic cloves. Add the potatoes, toss to coat and sauté gently for a minute. Remove from the heat and sprinkle the potatoes with Cape Herb & Spice Mediterranean Roasts Rub seasoning. Place a few slices of streaky bacon on the side and pop it in the oven. Check it after 15-20 minutes and remove the bacon as soon as it is nicely browned and super crispy. Spoon all that lovely bacon-flavoured fat over the potatoes and return them to the oven to roast until cooked through. To make bacon crumbs, chop the bacon into fine bits with a large chef’s knife or simply pop into your food processor. Serve the potatoes right away topped with the crispy bacon bits - yum!